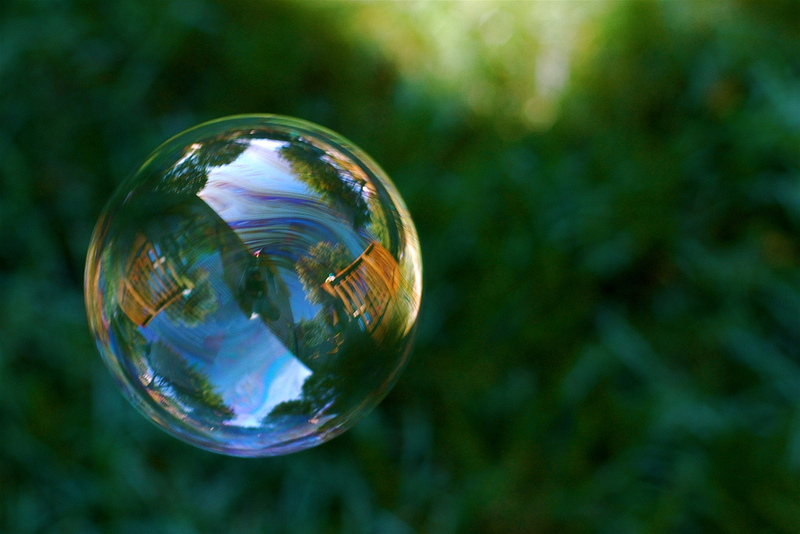 Is AT&T (s t) failing to keep its story straight about the need for more spectrum, or is it just that the popping of the spectrum bubble has taken them by surprise as well? Recently the nation’s second largest operator has seemed to back off from some of its more aggressive claims about how fast data traffic was growing. As Dave Burstein of Fast Net News first highlighted in late January, AT&T’s senior management told investors on two separate occasions last month that “The base increase of data consumption right now is growing 40 percent a year,” and “LTE does give us a 30 percent to 40 percent lift in network efficiency, but at current growth rates, that equates to only about a year’s increase in traffic”. Remarkably that 40 percent figure is not only far less than the growth rates projected by Cisco (s csco) and assumed in the FCC’s October 2010 working paper (which argued that 300MHz of additional spectrum was needed by 2014), but it also contrasts dramatically with the figures AT&T itself presented when it announced the planned takeover of T-Mobile in March last year. 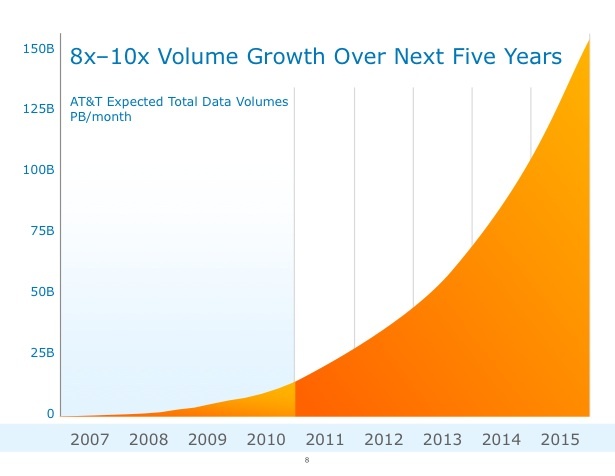 In that March 2011 presentation AT&T projected that data volumes would grow by 8 to 10 times between the end of 2010 and the end of 2015, based on an expectation that volumes would roughly double in 2011 and then increase by a further 65 percent in 2012. However, if we instead project out the current 40 percent increase in data consumption that AT&T is seeing then volumes would only increase by 5-6 times by 2015. Ironically, if that rate of growth was applied to the FCC’s October 2010 model, all of this data traffic would easily be accommodated for the rest of this decade by existing spectrum allocations under the FCC’s own assumptions of new cell site deployments and spectrum efficiency gains from new technologies. Why might AT&T’s data volumes have fallen so far short of the growth expected less than a year ago? Two obvious explanations stand out: it seems that offload to Wi-Fi is becoming far more successful than many expected, and AT&T is now cracking down on the top 5 percent of users of its unlimited iPhone (s aapl) data plans. With those “power users” consuming on average 12 times more data than other customers, and doing bizarre things like turning off Wi-Fi to save battery life while watching Netflix movies, it’s pretty easy to see how even a modest effort should reduce AT&T’s network loading significantly. Of course, going forward AT&T would still find it much easier to increase the capacity of its LTE network by using additional spectrum rather than going through the messy process of refarming PCS or 800MHz spectrum from GSM to LTE. Now that AT&T has handed over much of its AWS holdings to T-Mobile as part of the break fee for that deal, AT&T would need look elsewhere for this spectrum. So it’s hardly surprising that AT&T has been vocally proclaiming its opposition to the FCC placing any restrictions on participation in future auctions or on other potential acquisitions. However, with plenty of near term headroom on its new LTE network, the primary focus is likely to be on AT&T’s spectrum needs in 2015 and beyond. A time frame that will include its potential build out of an LTE-Advanced network. Ultimately, as many (including myself) have been speculating, it therefore probably does make most sense for AT&T to end up in bed with DISH Network and use its relatively clean 2x20MHz of satellite spectrum for LTE Advanced. This assumes the FCC allows this spectrum to be repurposed for terrestrial services in the near future. It could be argued that if demand growth is slower than previously expected, then AT&T might hold off on a decision for another year or more to see what happens with other spectrum bands (such as broadcast TV and AWS-3). On the other hand, if DISH’s alternative plan could potentially bring together other players like MetroPCS (s pcs) and even perhaps DirecTV to create a rival 4G network, AT&T may believe that now is the time to cement its dominant position alongside Verizon (s vz) (s vod) in the wireless industry. Thus ensuring that no-one else will ever be able to come close to the spectrum holdings and network coverage of these two players. Tim Farrar is President of Telecom, Media and Finance Associates, a consulting and research firm in Menlo Park, CA, which specializes in technical and financial analysis across the satellite and telecom sectors. Image courtesy of Flickr user Jeff Kubina. Actually the T-Mobile deal WAS very much about spectrum. T-Mobile owns about 25 MHz of AWS-1 (LTE Band 4) spectrum that AT&T’s current LTE phones were designed to use along with their Band 17 700 MHz. So to combine AT&T and T-Mo 850/1900 spectrum for GSM/3G, and repurpose T-Mo’s AWS for LTE was to my way of thinking an EXCELLENT idea in terms of frequency standardization(which this country badly needs) and network efficencies. Instead we got competitors, judges, commissioners and consumers screaming about network irrelavancies like competition, prices, and jobs. I’m sorry, but corporstions are not philanthropies under obligation to provide for society’s livelihoods. This deal should have been allowed to close without hinderance, adjustment or condition. Now, AT&T, like Sprint, is left with marginally-functional phones on it’s hands due to either suspension(Clearwire) or denial (DOJ/FCC) of necessary network expansion all in the name of competition, prices, jobs, and other financial impediments. It amazes me how wireless in the rest of the world doesn’t have this problem. Corporate executives tend to be like teens caught up in some rock star. In this case, the fad is for more spectrum. But this growth in demand for data is also a good rationale for other schemes that reuse spectrum more efficiently, including shrinking cell size and nano-cells in high use locales. Think of the narrow spectrum allocated for WiFi and yet how many people use it. That’s because they’re not putting their WiFi routers on top of 80-foot towers. And keep in mind that AT&T’s T-Mobile buyout was never about getting more spectrum. T-Mobile doesn’t have much to offer there. It was about getting rid of their only major GSM competitor and the one cellular company that’s actually trying to compete with good service and lower prices.